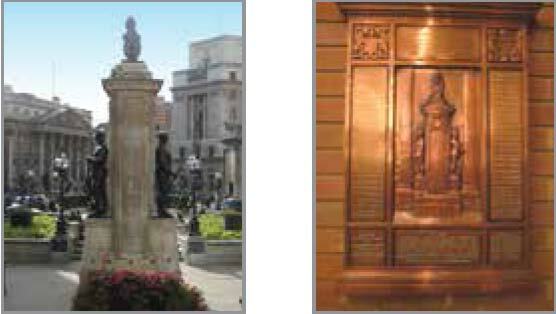 The London Troops Memorial that stands in the City of London, in front of the Royal Exchange, was erected in 1920 and is dedicated to all those from London Units who fell in the conflicts of 1914-1919 and 1939-1945. At the time of the original dedication, each unit listed was presented with a bronze plaque repricating the memorial to be displayed in their Headquarter locations. Many of these plaques still survive and have been tracked to their current 2014 locations. Some are stored, some have been preserved in museum collections and one is in a memorial park in Fulham. However, the majority are affixed to the wall in the Drill Hall of the successor unit as was originally intended. Compiled by The Reserve Forces’ and Cadets’ Association for Greater London © 2014 All rights reserved.